Sun Moon Lake located in Nantou County, Taiwan. The lake is approximately one hundred square kilometer, and north part of lake is referred to as the sun and the south part is referred as the moon. In the early days, Taiwan imported broad leaf black tea from India and selected Nantou County for plantation. Nantou county has the proper climate with plenty of rain and humidity, which creates a suitable environment for cultivation. 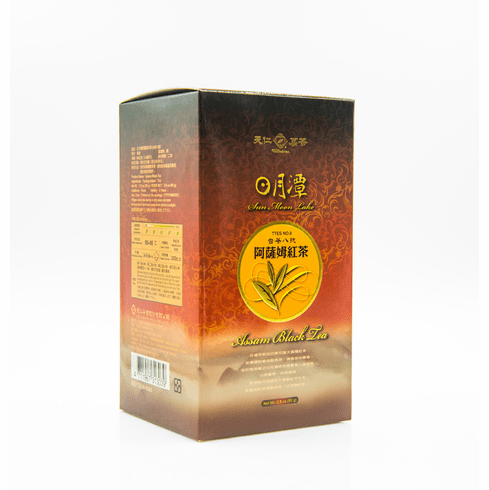 Sun Moon Lake Black Tea is in the broad category, the appearance is long and loosely thin. The tea color is clear and vivid red, and the taste is sweet and mellow with a hint of natural floral aroma. The aroma and taste of Sun Moon Lake Black Tea can definitely measure up to with Black Tea from India and Sri Lanka. The water used to steep this tea should be about 194-203�F or 90-95�C. Use about 2 teaspoons (5-7 grams) of tea leaves for about every 5 ounces (150 milliliters) of water. A steeping time of about 2-3 minutes is recommended with more or less time is depending on the desired concentration. As a rough guide, the higher the temperature of the water or the greater the amount of leaves used, the shorter the steeping time should be. Net tea weight 2.8 ounces (80 g) and shipping weight 0.51 lb.